Feminist government: How well is Wales doing? Wales is aiming to have a feminist government and to become one of the safest places for women in Europe. Former First Minister Carwyn Jones made the pledge to aim for true equality a year ago - so how well is Wales doing in reaching this goal? 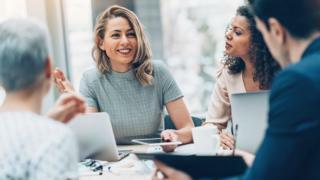 It is making "some strides", according to a new report published by the Women's Equality Network (WEN) Wales and Oxfam Cymru. But, despite "good intentions" there has been a "lack of funding and urgency", it added. The Welsh Government said it was "committed to improving gender equality". "Little progress" has been made in two areas - ending violence against women and girls and jobs and pay equality for women. However, "despite robust legislation and good intentions to advance gender equality, there has often been a lack of funding, a lack of strategy, and lack of a sense of urgency to see them through," the report said. With pay equality, "women still hold the majority of low paid jobs in Wales, and the gender pay gap persists". But in terms of the the gender balance among assembly members, at 47%, it is better than in any other UK parliamentary body. What exactly is a feminist government? Sweden has a feminist government and according to its website, it means they are committed to building a society in which girls and boys, women and men have the same power to shape society and their own lives, and live their lives to their full potential. Gender equality is a human right and is ultimately a question of democracy, representation and social justice. At the same time, gender equality is part of the solution to creating jobs and growth, it says. Catherine Fookes, director of WEN Wales, said: "We are pleased to see that Wales now has as a gender balanced cabinet, and we have strong equalities legislation in place. "We would like to see legally binding quotas put in place ahead of the next local government elections and assembly elections so that we have a 50:50 assembly and 50:50 councils. "We would also like to see strong targets on halving the gender pay gap." Is Sweden's feminist agenda working? Rachel Cable, head of Oxfam Cymru, added: "Welsh Government has shown excellent intention, but now we need action. "The scorecard is a snapshot in time, and a marker in the sand to move forward from." Image caption Carwyn Jones said in May 2018 "we've said we want to be a truly feminist government - we now have to live up to that"
The findings will be presented to Deputy Minister and Chief Whip Jane Hutt AM who has responsibility for equality and human rights at an event on Saturday at the Welsh Labour conference in Llandudno. A Welsh Government spokeswoman said: "We already have world-leading legislation in place, but we realise there is still progress to be made. "We have commissioned a gender equality review to advance gender equality and identify where action needs to be taken to continue to improve the lives of women and girls." What is the gender pay gap at your company?